In addition to being an alluring travel destination, Bali also has alluring coffee. 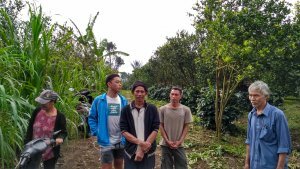 We visited Manikluyu Village co-op in the Kintamani highlands, which produces most of Bali’s coffee, to see what we could find. Bali, known as the Island of the Gods and listed by TripAdvisor as the world’s top destination for 2017 has a lot more to it than beaches, yoga, and Hindu ceremonies. One of those things is being home to fine Arabica coffee. We visited along with friends who work with farmers and decided to collaborate with this co-op. 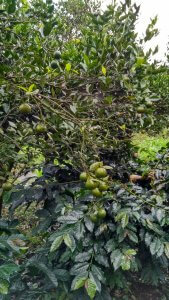 The Manikluyu Village is a traditional agricultural village; they grow citrus fruit and in the last few years have expanded into Arabica coffee to increase their income. Bapak (an Indonesian honorific similar to Mister) Wayan leads the co-op of about 50 farmer families. 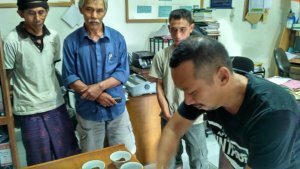 Bapak Wayan and the members of his farmer co-op are willing to learn and implement best practices. That is a relief because going into areas and attempting to get coffee farmers to change from less than optimal practices (like picking only the reddest, ripest coffee cherries) is usually very difficult. 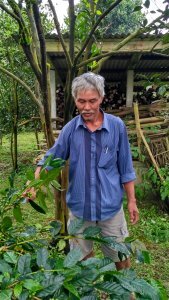 One practice we observed that needs change is the fact that if the price offered for coffee is low in a given year due to market conditions the individual farmers would rather save their corp in parchment and wait until economic conditions improve. This has all kinds of negative consequences. They just end up storing a bag of coffee in the kitchen next to the stove, or some other store room, for months. By the time this coffee is sold it’s usually aged, insect damaged and maybe even starting to mold if the weather has been too wet. It is nowhere close to the specialty grade coffee it may have started out as. In the end the farmers are worse off because they cannot expect to receive anywhere close to a decent price for old, bug-eaten coffee. The solutionto this is that we are in place to offer is a long term relationship with this co-op and many others we are finding. Our friends on ground have a desire to continue to work with the co-op and we have a desire to bring their coffee to an international market at a decent price to the farmer. Bapak Wayan (Right) and farmer members of the Manikliyu co-op. We hulled, roasted and cupped on sight. Tasting their own coffee was a first for some of the farmers. The greatest part about the trip are the relationships we formed both with the co-op, and with someone willing to work with the farmers to make their products even better. Coffee economics usually present a raw deal for the small holder farmer. We are working with Manikluyu now to turn the tide against unfair practices and bad coffee. We continue to score hits with coffee from this region. The coffee itself has high toned citrus-type acidity, is full bodied for the natural processed variant and also has cocoa notes. Head over to the store to check out our supply of this coffee.